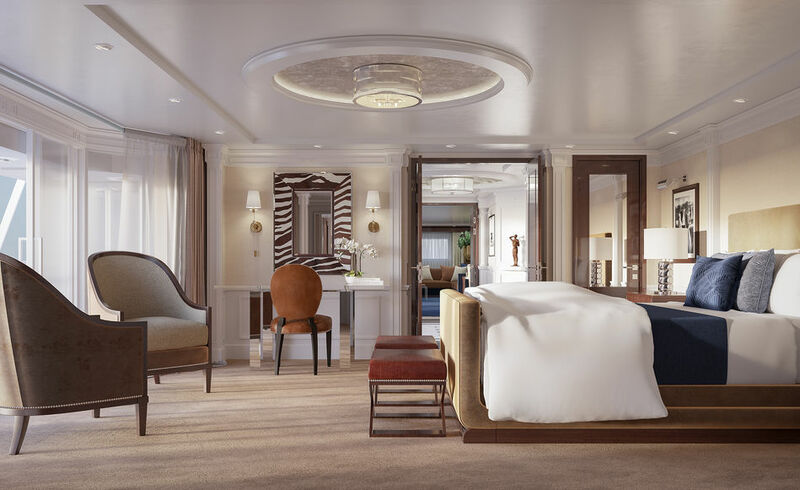 The new Ralph Lauren suites are decorated in navy, white, crème and camel. Fabrics and upholstery are a mix of stripes and solids, with hints of metallic, silver and gold. Even details such as the red, white and blue striped fabric selected for the outdoor cushions on the suites’ verandas harken back to Mr. Lauren’s label as “America’s designer”. Guests will enter through the foyer with a limestone and black cabochon inset floor, walls of inset Georgian wood panelling and a mahogany and quartzite bar. Spacious and airy, this grand room features sea-views from floor-to-ceiling windows dressed with Ralph Lauren Grimaldi-weave sail fabric, along with a self-playing ebony piano. The elegant living room also features a new saddle-suede sofa accented with navy cushions and accompanied by a mahogany Lounge Moderne chair upholstered in navy and white Super-Yacht Stripe. The centrepiece of the dining room is the Mayfair dining table with a new Barrett Knurled chandelier overhead. The master suite, which is an entire retreat unto itself, has taken on an entirely new persona with a new Cote D'Azure king-size bed, elegant Mayfair Bergere side chairs upholstered in Sutton Suede Doe and nickel-trimmed lighting accents. 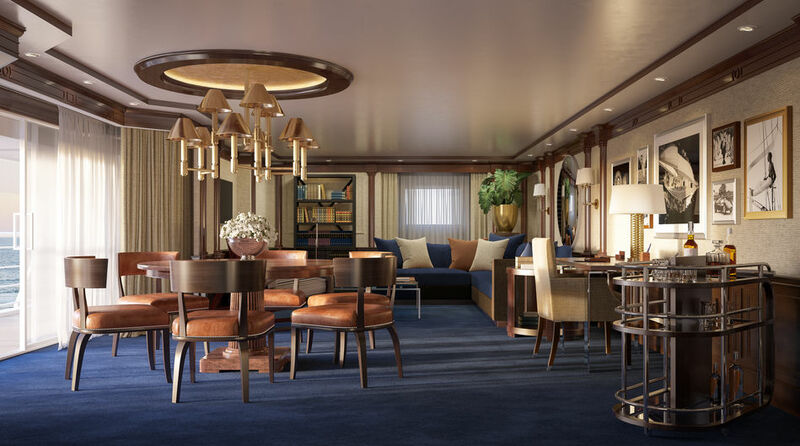 Finally, the wraparound teak verandas feature stylish pieces that were custom-crafted by Ralph Lauren Home for Oceania Cruises. Each of the six Owner’s Suites measures more than 2,000 square feet and spans the entire beam of the ship. Boasting a large living room, a master suite with king-size bed, two walk-in closets, indoor and outdoor whirlpool spas and a dramatic entry foyer with a mahogany bar and ebony grand piano, these suites also include exclusive card-only access to the Executive Lounge with a private library. 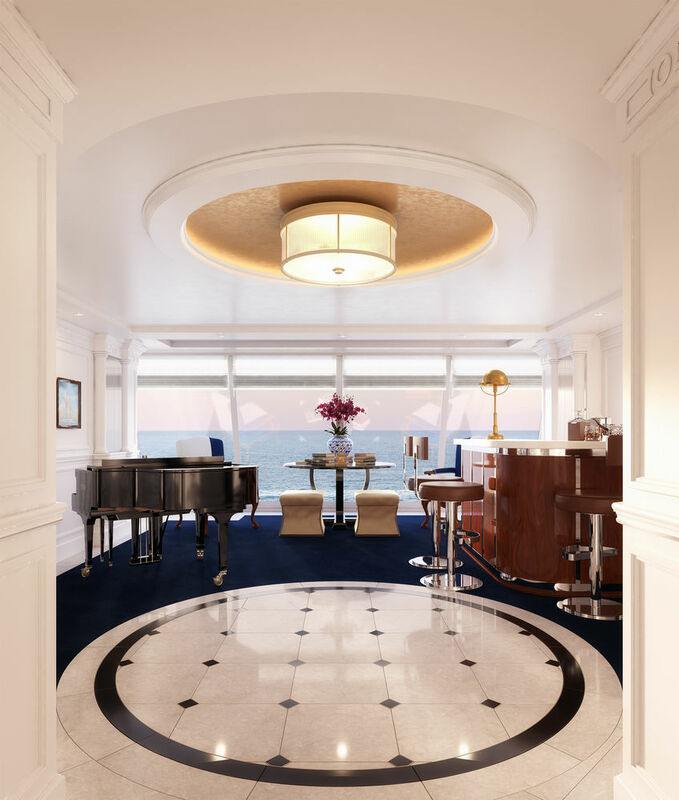 Designed by Los Angeles based Trevor R. Howells Interior Design, the Owner’s Suites reflect Ralph Lauren’s passions for sailing, Hollywood glamour and timeless, classical beauty. Howells specifically selected furnishings to highlight Ralph Lauren Home’s unique design presence in a world filled with sameness. Utilising fabrics such as the “super yacht stripe” and signature pieces such as the Clivedon carved chairs and Pall Mall cocktail table, the Owner’s Suites aboard Marina and Riviera capture the joy of travel, the thrill of adventure and surround travellers with the impeccable style of Ralph Lauren.